The campus is a great place to carve out the devotion habit. Yes, the pressure is on with classes, but this is preparation for life commitments. Consequences in college are called grades. Consequences in life are called rewards and punishment. I've got a confession to make: I like school. That's right. I said it. I like school. I miss it, in fact. I'm up in Ironwood, Michigan tonight for work. 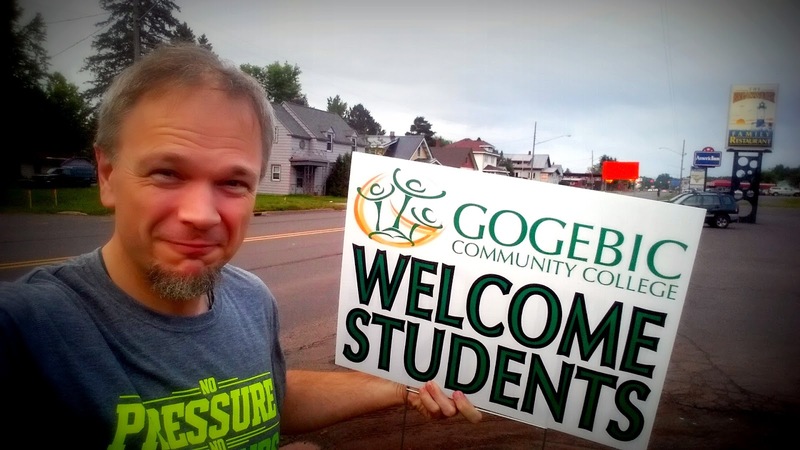 Signs are everywhere welcoming students back for the Fall 2014 semester. I'm jealous. I actually went for a cruise in my rented Jetta trying to find the college. My AT&T Android navigation seems to have lost its direction somewhere near the WI-MI line. Anyhoo...I did find this sign beside my hotel. Looks celebratory, doesn't it? Getting back to campus always was. No assignments yet. Bumping into your old pals. Activity everywhere and people all fired up for a fresh start! Here's what I want now, though. I sorta got it back then. Now it's concrete. God is the author of all life and purpose. I want to connect with his fire and direction, his passion and wisdom, for every bit of hope that I feel. Do you remember my core value of devotions? A lifetime of meaningful connecting with God through the great varieties of prayer and the Word. What will be the daily habit you embrace to strengthen your core values? Devotions are about discipline, about ritual. Devotions are about smacking the alarm clock and grabbing your Bible. It’s sneaking away for an afternoon prayer walk. It’s digging for the meat of the Word late in the evening. Devotions are where the spiritual gets practical. Set goals for your relationship with God. Put meeting times with God on your student planner. One semester, I took my routine and taped seven daily columns of colored 3x5 cards on my dorm room wall. Whatever you have to do, remain committed to what’s most important. Whatever your campus...college or life...fire up daily in the presence of God! How's God's Word ringing true in your heart tonight? How's his glorious presence changing your life in prayer?